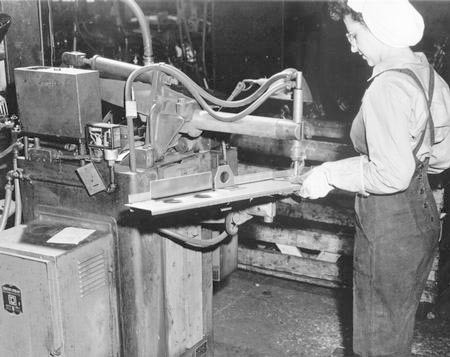 Woman operating drill at the Youngstown Steel Door Company during World War II, 1941-1945. During World War II, millions of American women assisted the war effort by working in various industries. Before the war's outbreak, twelve million American women found employment in factories. The number of women working in such positions during the conflict soared to nineteen million women. More impressively, middle-class women increasingly sought employment, accepting positions previously held principally by men or working-class women. The United States government and Americans in general referred to these women as "Rosie the Riveter." "Rosie the Riveter" was based on Rosie Will Monroe, an assembly line worker at the Ford Motor Company plant in Ypsilanti, Michigan. Monroe helped build B-29 and B-24 airplanes for the war effort. Hollywood producers selected Monroe to act in a movie encouraging women to seek employment in wartime industries. Women who worked in such positions became known as "Rosie the Riveters." The idealized "Rosie the Riveter" exhibited numerous characteristics that the government and men found acceptable. First, these women were to work both outside of the home and inside of the home, contributing to the war effort, while still maintaining their traditional roles as housewives and mothers. Secondly, these women exhibited patriotism, helping their loved ones in the military attain victory, while still longing for a return to pre-war normalcy. Finally, most men believed that these women would want to return home after the conflict, and thus, these men did not have to worry about losing their civilian jobs while serving in the military. The federal government utilized the image of "Rosie the Riveter" throughout World War II. One of the most famous posters of World War II, the "We Can Do It!" poster, used "Rosie the Riveter" to encourage women to seek factory positions. Women clearly responded, with approximately one-half of all adult American women in war positions by 1944. "Rosie the Riveters" experienced many opportunities during World War II. New job opportunities and increased wages were undoubtedly the two largest advancements. Also, many of these women joined unions. Before World War II, most unions refused to represent women workers, believing that women should remain in the home. Despite these advancements, most women, whether they wanted to or not, returned home upon World War II's conclusion. Those who tried to remain in the workforce faced lower wages and discriminatory hiring and promotion tactics. The men's expectations that women would forsake their wartime positions added impetus to the women's rights movement during the 1950s and the 1960s. Nevertheless, women across the United States, including in Ohio, contributed to American victory in the war, serving as "Rosie the Riveters." Today, the National Park Service is creating a special museum in California to honor all of the "Rosie the Riveters" who worked during World War II.